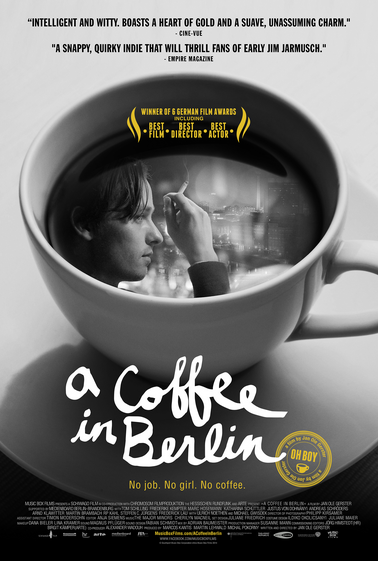 Opening Friday is the film A COFFEE IN BERLIN. I saw this film last year when it played last year’s KINO festival of films from Germany at the Museum of Modern Art. At the time the film had the Title Oh Boy. I really liked the film and I’m happy that more people will now get a chance to see it. One of the more lovely looking black and white films of recent years, this is a film that you'll want to see on the big screen simply for the look of the film. My reaction when the film started was simply to murmur Oh My. The film follows Nike Fischer, a nice guy who's action and inaction has set him on a course that forces him to look at all of the errors of his ways. Told in a frequently humorous, but not cruel way we watch how in rapid succession is dumped by his girlfriend, is denied his driver's license (after one too many drunk driving arrests), has to content with not having money to buy coffee, and is brought face to face with a girl from his past who he tormented when they were in school and she was fat. There's more but Oh Boy is right. A wonderful small scale film this is a film that I wasn't expecting to like and turned me into a fan. Its film that cleverly makes us examine our own lives again and again as we watch Nike forced to look back over his. This is one of those films that makes you wonder why it is that so many other independent producers can't do something similar or this good. This is the sort of film so many people try to make but fail to achieve. Definitely worth putting on your list of films to see.